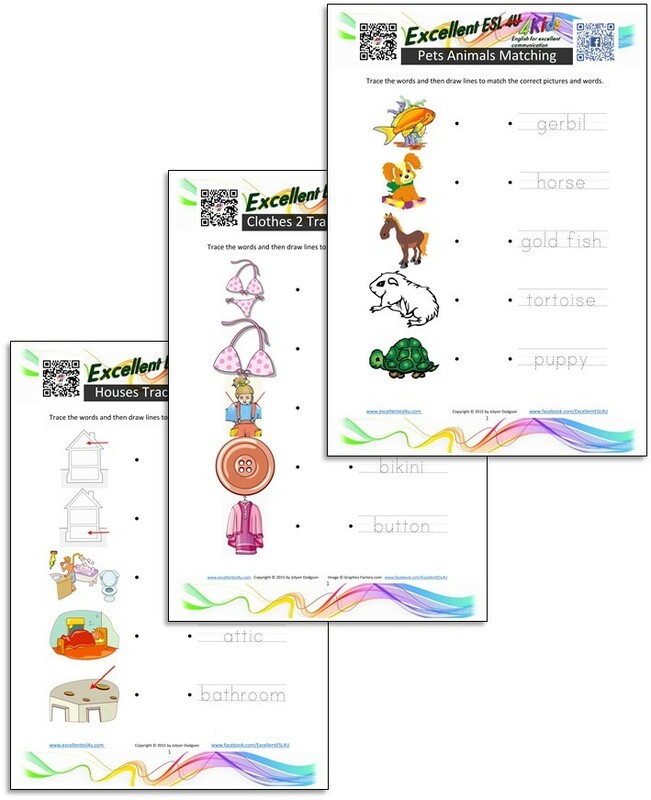 This page has a list of all the ESL kids worksheets that are on the Excellent ESL 4u site. 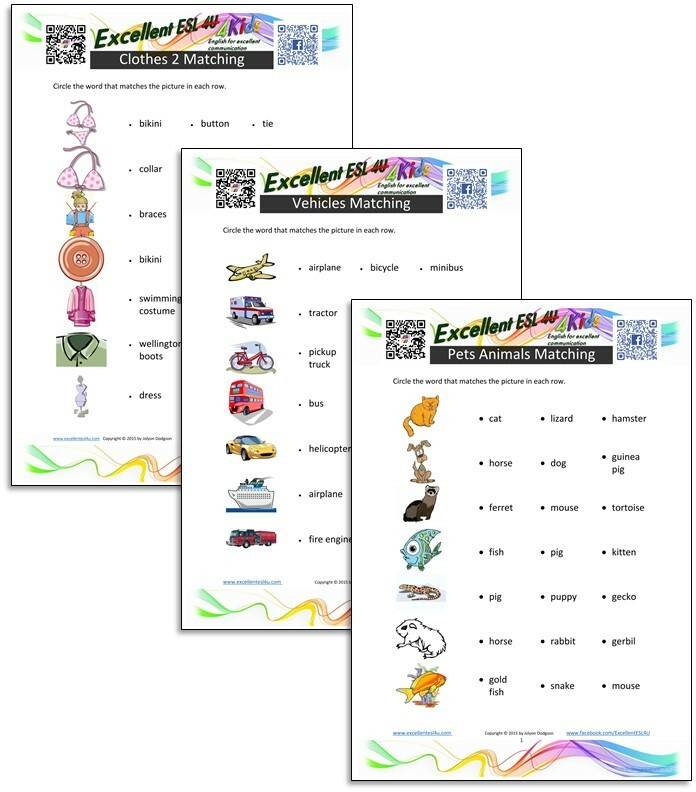 You can download them all free to use at home with your kids to help them get better at using English. 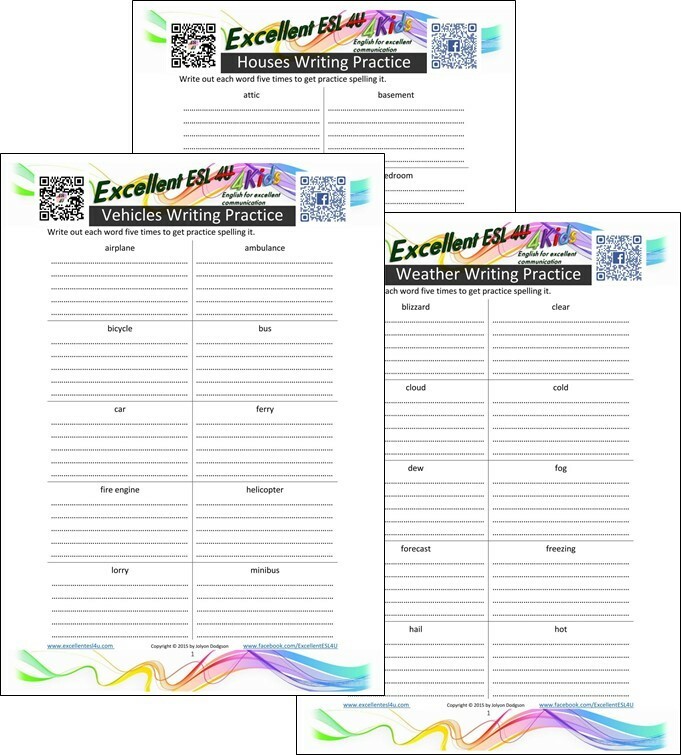 There are five different types of worksheets on this page, and there is one of each type about each vocabulary topic area. This is good as there is plenty of repletion to help your children learn all the words. When trying to teach your children English you should start with vocabulary. 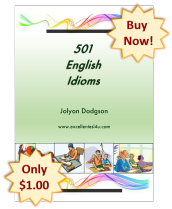 The ESL kids vocabulary page has short lists of vocabulary about topics that will interest kids and be useful for them to know. 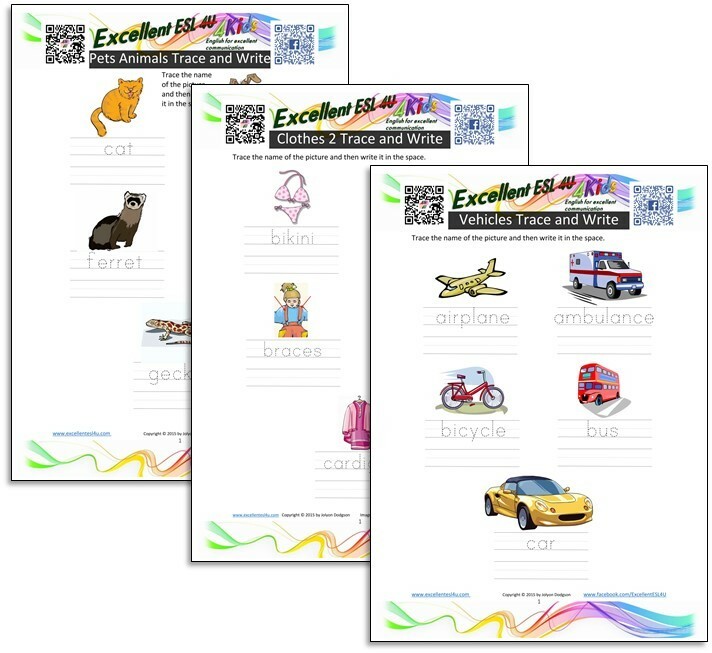 Each vocabulary list is also presented as ESL kids picture flashcards that you can use to make sure your kids know what each word means. There is also the ESL kids alphabet writing page that has videos that show how to write each of the letters in the alphabet as well as work sheet to practice writing the big (capital) and small (lowercase) version of each letter. 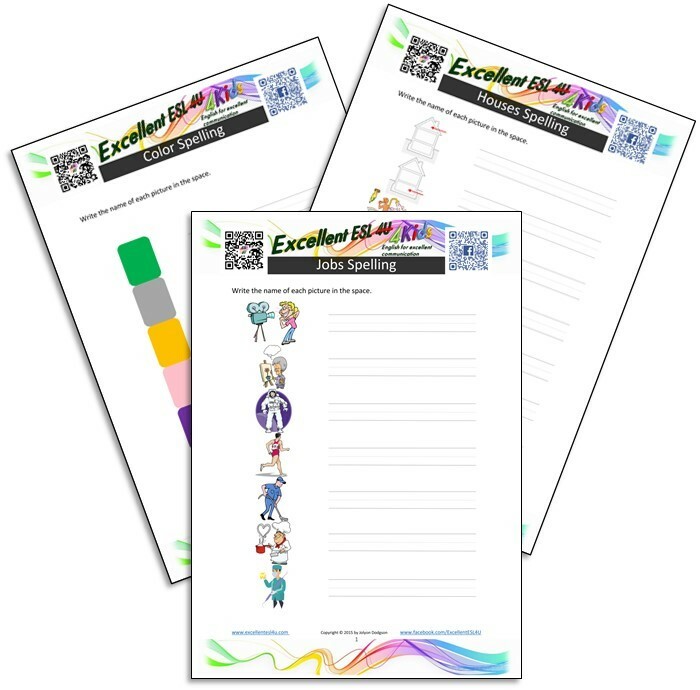 If your child or children have any problems writing the letters, you should possibly use these worksheets first. Once your children have started to learn the vocabulary, you can try some of the ESL games for kids to help them remember the words. As well as the wordsearches for kids. All of these are organized by the vocabulary topics. This means that you can focus on one topic at a time and really make sure that your kid is confident about using the vocabulary before moving on to the next topic. 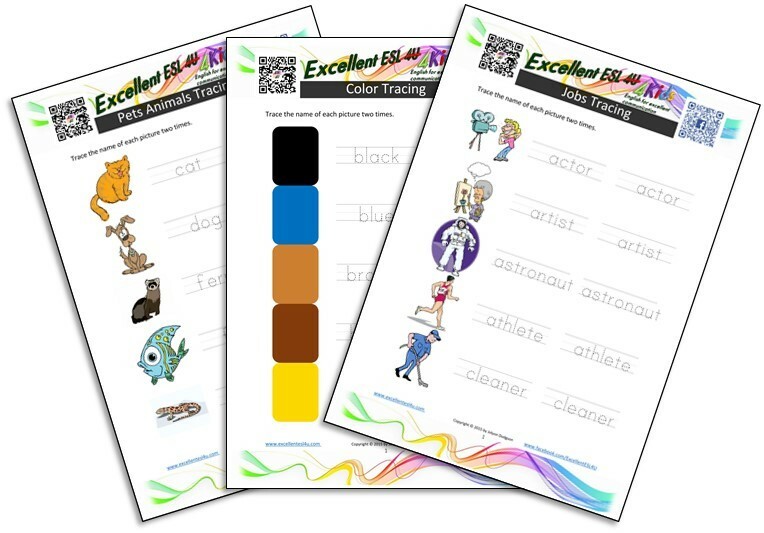 After doing all of that it is time to start to use the ESL kids worksheets on this page. These worksheets and the writing that needs to be done with them will be good revision of all the words already learnt. If you liked anything on this page please remember to like the Excellent ESL 4u Facebook page. 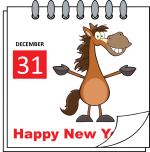 You can also sign up for my ezine (online magazine) using the sign up box in the right-hand column; this will keep you fully up to date with all the new pages on this site.